I came across this area by happy accident in 2018 when a ski sailing trip was made impossible by excess ice keeping the boat in dry dock. 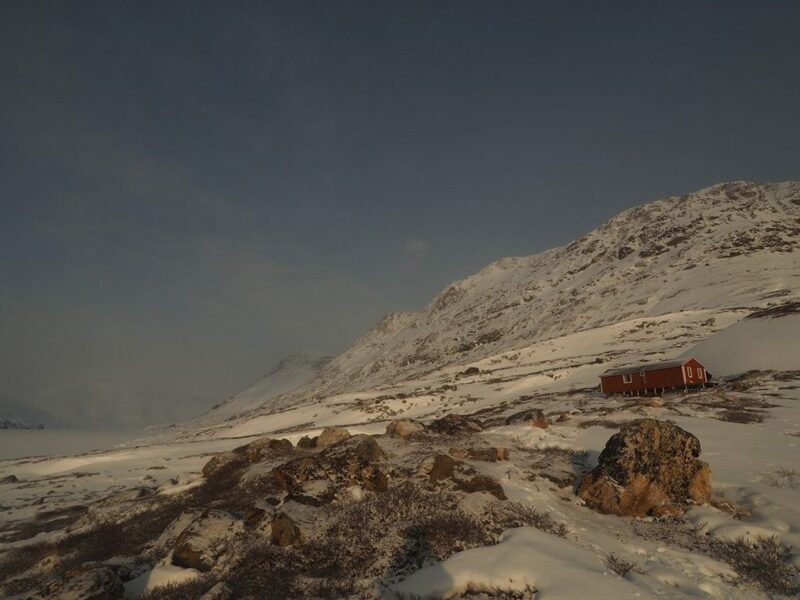 The boat crew, stranded in a remote arctic village, found this remarkable area with a hut to replace their yacht. You can see how our 2018 adventure unfolded here . In summary, it was a fantastic discovery. 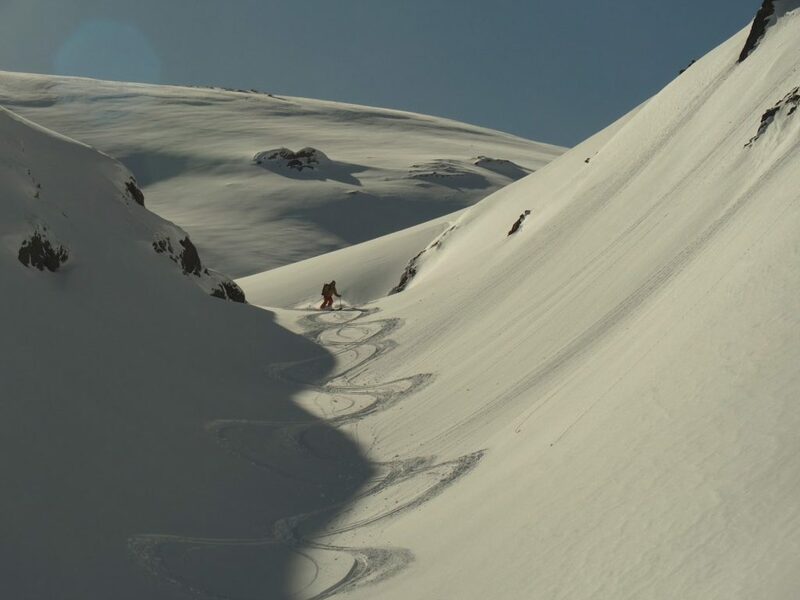 The massif has been skied by just a handful of folk, and we skied several new lines during the 2 weeks in late April/early May 2018. The local logistics operator was helpful, flexible and reliable, and the hut catering from Andy and Janice, the crew of the Destiny with whom I’ve worked for several seasons, was outstanding. 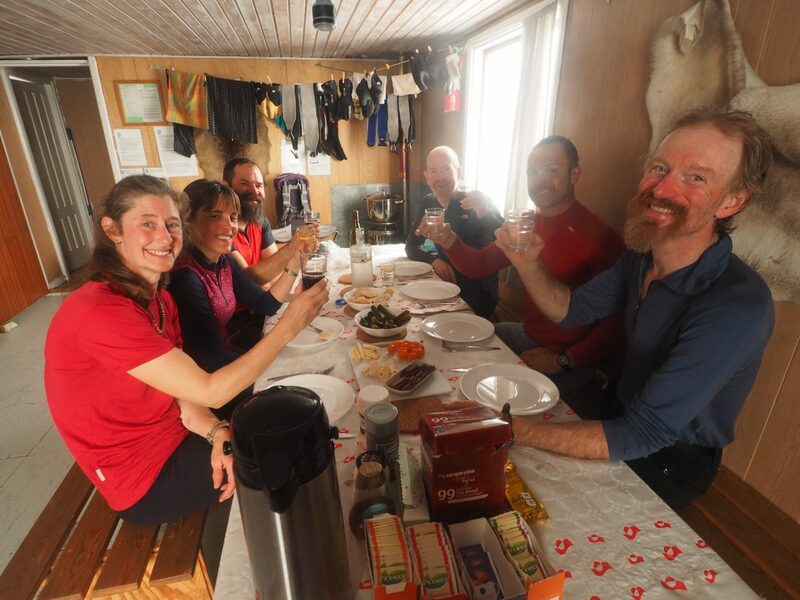 With the hut being the only accommodation in the fjord, we were the only skiers in a massif measuring over 1000 square kilometres. Given the area’s recent discovery and the temptation of a small minority of commercial guiding companies to use my site for their R&D, precise details of the area will be provided once I have received a bona fide direct enquiry. E1: The mountains in the area are between 800 and 1200m high, and we are based approximately 30m above sea level. The hut is warm and comfortable. 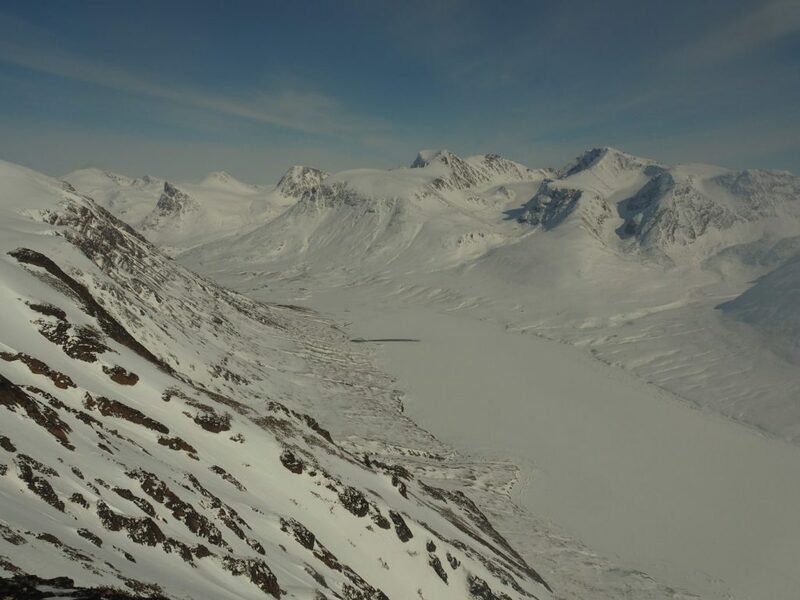 Outside temperatures in 2018 ranged from -5 to -15°C, and winds were mostly light to moderate. 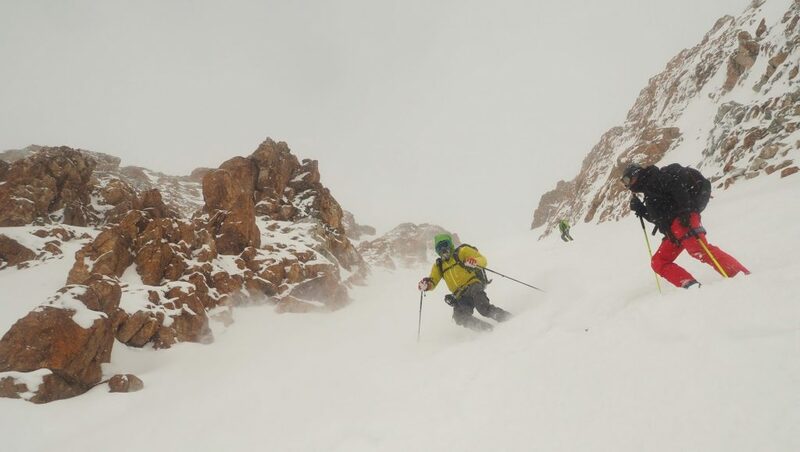 S3: The terrain is varied, with lines to suit most competent ski tourers. Typical descents are in the 25 to 30° zone. Cover can range from calf deep powder to a firm Arctic style snowpack, so we will need to be effective and versatile underfoot. M1: Apart from a few short bootpacks using crampons, very little mountaineering ability is needed. The terrain is not glacial, though harnesses will be carried for scrambling terrain or steeper bootpacking. We have 2 provisionally booked time slots. To keep things as cost effective as possible, I aim initially to fill the first slot of 22 April to 1 May. If there is sufficient demand, we can easily insert a second week 29 April to 8 May. 29 April Fly to Copenhagen and meet the team. Spend the night in a hotel close to the airport. Note that the departure on 23 April is at 1100 so with an early flight from the UK on 30 April it would be possible to avoid the cost of a hotel night in Copenhagen. 30 April Flight from Copenhagen to Kangerlussuaq, the hub airport for west Greenland. The flight leaves at 1100 CET with a duration of just under 5 hours. After a short interval, we fly a final hour to the small airport at the destination village on the west coast. We are met by our hosts Andy and Janice and transferred by minibus to a local hotel. Here we’ll check gear, load the sleds for the transfer the next day and take the chance to wander round the village, check out local handicrafts and meet the locals, both human and canine! Accommodation will be in shared twin rooms with an evening meal in the hotel restaurant. 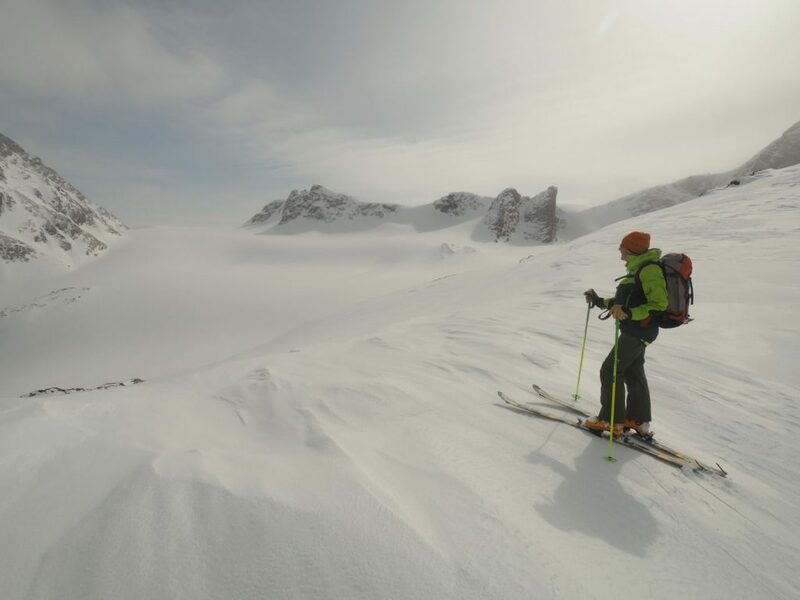 2 – 5 May Ski touring from the hut. After a healthy breakfast, we’ll set off. There is one group of itineraries that set off from directly behind the hut. 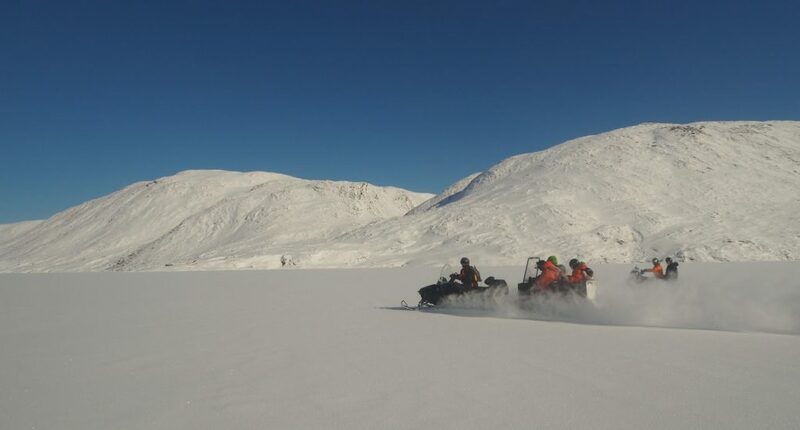 We can also get towed across and/or along the fjord behind the snowmobile to access a huge number of lines. If weather and logistics permit, we can use the trailer to get us over some rolling terrain to traverse over to a parallel valley, from where the snowmobile can collect us and bring us back to the hut. Typical vertical intervals are around 1000m , so expect 3 to 5 hours of ascent depending on the terrain and conditions. Andy and Janice will supply us with sandwiches, homemade biscuits and hot drinks for the day out. The descents are typically on wide slopes or couloirs. Visibility can be varied – this is, after all, the Arctic! 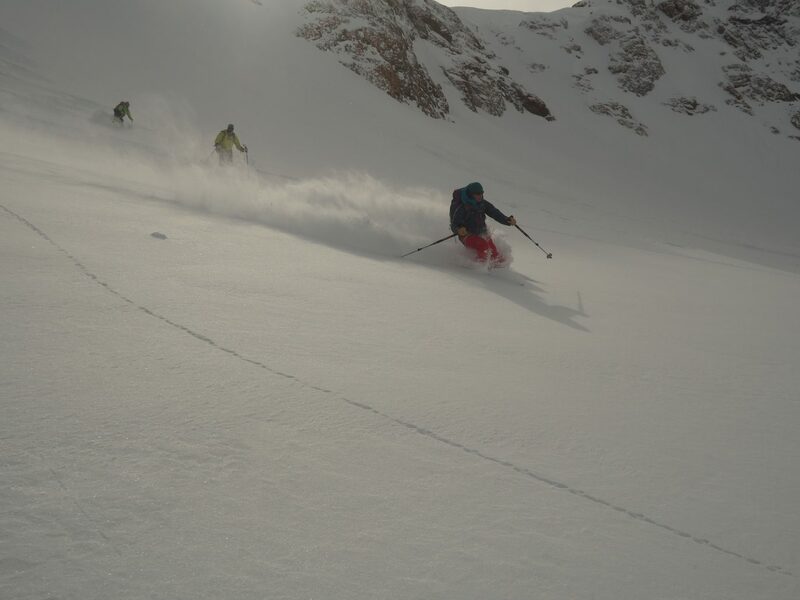 In the 2 weeks I spent here in 2018, I had 50% blue sky days, a fair amount of cloud and flat light which meant skiing couloir lines, one day that was foggy and only one where we were confined to base by snow and strong winds. 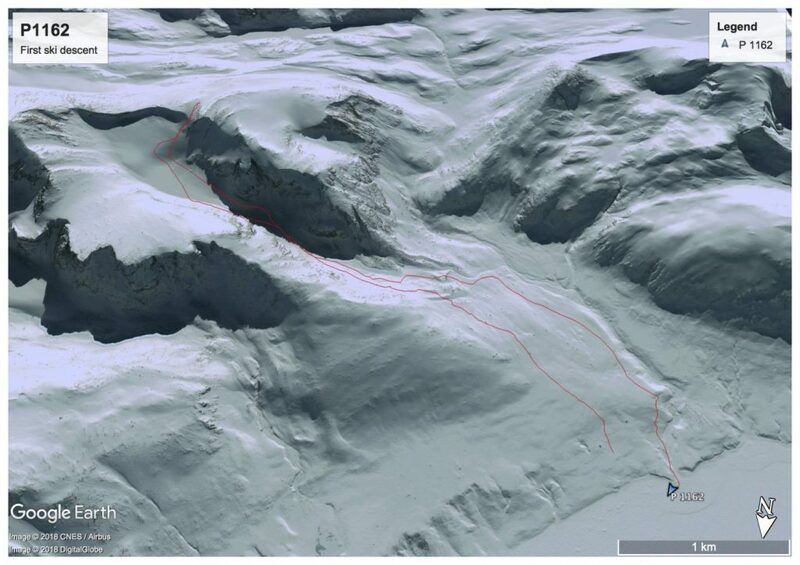 Avalanche risk was fairly straightforward to manage and on an EAS it rated moderate most of the time with a few days at considerable and one at high. On return to the hut, we have some hot soup, then relax or throw in another lap behind the hut. Dinner is plentiful and well-deserved! 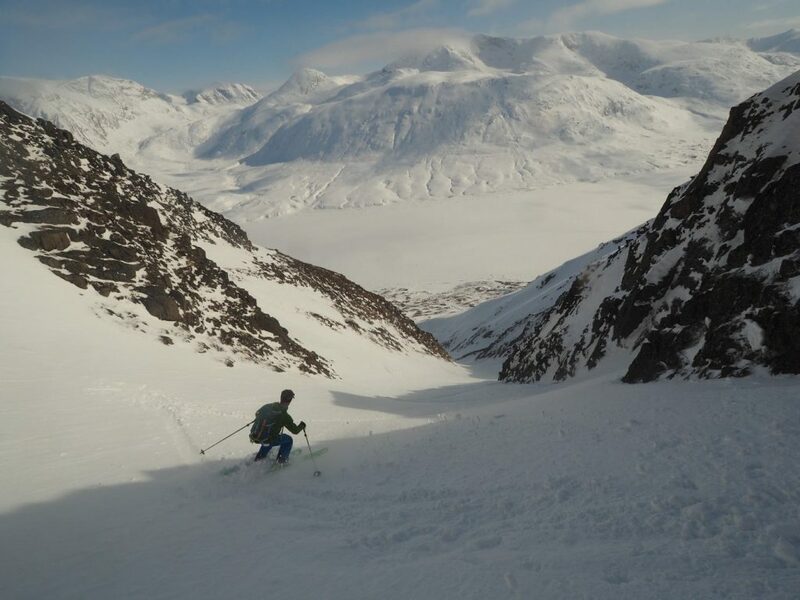 6 May A ski tour, and then the logistics team will arrive to collect us in the early afternoon. We will transfer back to the village for a night in the hotel, a welcome shower and access to the spa and sauna! Dinner at the hotel and an opportunity to buy souvenirs. Flight to Copenhagen from your point of origin: there is a wide variety of operators. For a relaxed approach, aim to arrive in Copenhagen on the afternoon/evening of 29 April. Flight to the final destination via Kangerlussuaq is with Air Greenland. We travel in to the hut on snowmobiles. Some of the team will be riding pillion on the snowmobiles, and some will be in the trailer, known as the ski bus. In Copenhagen, there are many hotels near the airport. I have two noted from this year which are good value and comfortable. On arrival in the destination village, we will be in the only hotel. We’ll be in shared twin rooms. 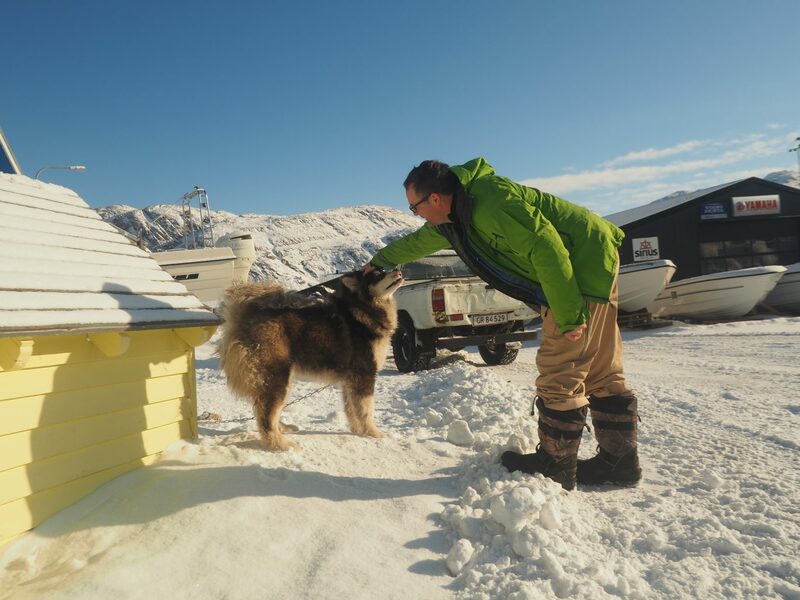 The hotel has a sauna and spa, a restaurant and bar and is halfway between the centre and the edge of the village where the huskies are kept, known as “Dog Town”. Cuteness abounds. The hut where we will be based is warm and comfortable. It has a kitchen and dining room equipped with a diesel stove, which can also be used to dry kit. The dormitory has 10 bunk beds. 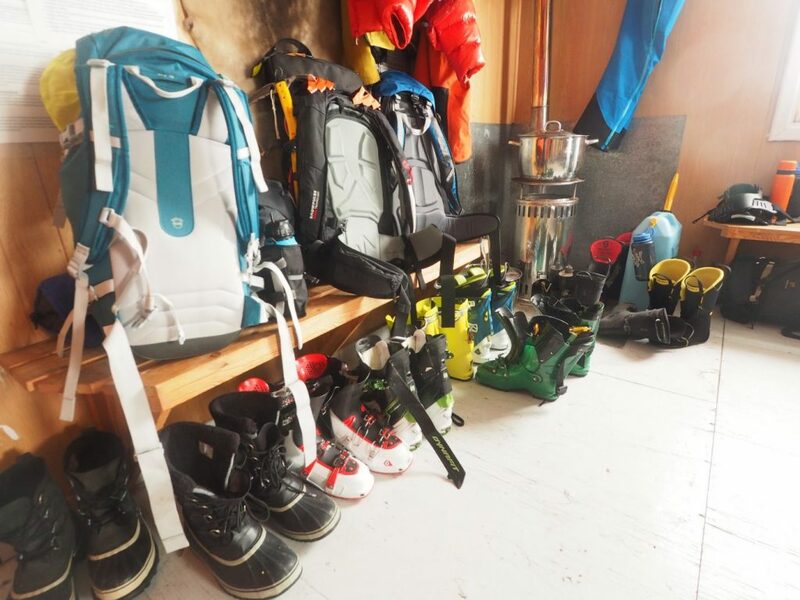 The entrance hall is used to store clothing and skis, and there is a dry toilet inside. There is no running water at the hut but we have plenty of water from the nearby stream. A down jacket is useful for the ski bus in the mornings, and I found a neoprene facemask nice for the transfer from the village. It’s not often I use mitts, but this is one time where I did. There are no guidebooks to the area at all. Maps are limited to a 1:100,000 map. 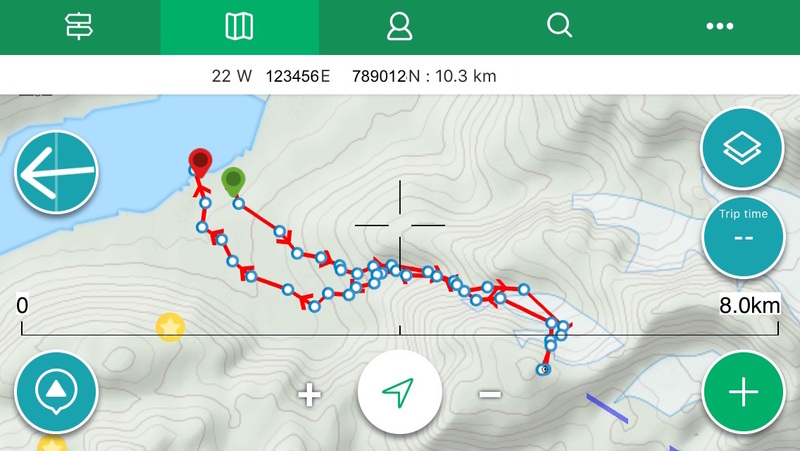 We made very good use of Viewranger and Google Earth in 2018. See here for more detail on this. On booking I will send you some maps of tours we did in 2018. Insurance which is valid for rescue and repatriation from the Arctic is mandatory. A good starting point is the BMC. Different skiers last year had different levels of questions they needed to answer, even with just one insurer! Given the level of flight cost, you are strongly advised to take out cancellation insurance. Payment will be in 3 stages: an initial payment of ~33% to confirm your booking, a second payment of ~33% in December 2018, and a final payment of the balance in February 2019. • There are a limited number of budget tickets at the Takuss rate at just over 5000 DKK. These have zero flexibility and no refund in the event of cancellation. • Alcohol (!) – which is eye wateringly expensive in Greenland and so should be purchased in the duty free at Copenhagen. For more details, please contact me via the contact page on my website. You can also call or text me at +33 6 1990 6730. Once we’ve established this is the right tour for you, I will then ask you to fill out a booking form and will send you an invoice for the first deposit. I look forward to hearing from you. The area is amazing and is well worth the effort.